More than 170,000 trade visitors flocked to Interpack, Düsseldorf this month to see the offerings of over 2,800 exhibitors from around the world. We were delighted to welcome both existing and new customers to the stand, which gave us the opportunity to discuss & review their individual manfacturing needs. 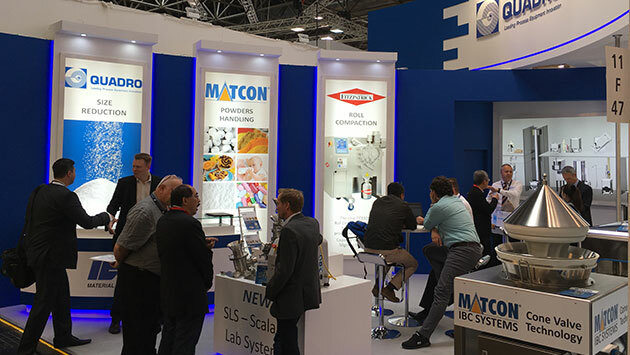 On display was a 1000L IBC and our Discharge Station exhibit, showing the Matcon Cone Valve in action, along with further exhibits from our IDEX MPT group colleagues - Quadro & Fitzpatrick. We would like to say a big 'Thank you' to all who visited our stand & we look forward to seeing you again at future events.